Tokyo Disney Resort: Beyond the Theme Parks! During my 14-day trip to Japan, after I spent an amazing day at Tokyo DisneySea and another incredible day at Tokyo Disneyland, I felt like I was missing something. I had packed in two full days at the theme parks, leaving no time to explore the rest of Tokyo Disney Resort. And so, I added another “Disney day” to my schedule. This day would be dedicated to seeing the three Disney hotels and whatever else the Tokyo Disney Resort had to offer. 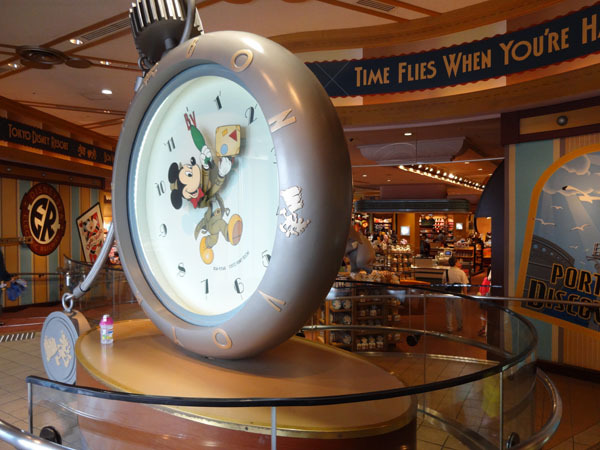 In order to make the most of my previous precious theme park days, I hadn’t spent much time shopping in the parks, and so my first stop on my third day at Tokyo Disney Resort was the resort’s huge gift shop, Bon Voyage. Bon Voyage carried many, but certainly not all, of the Tokyo Disney theme park items that I had seen for sale inside the parks. With no rides or shows vying for my attention, I examined the gift boxes of cookies and snacks, Disney charms, Disney hand towels, Disney plush characters, Disney jewelry, Disney car accessories, Disney chopsticks, Disney-character-tail lint rollers, Disney-themed Q-tips, and Disney character hats that I’d never seen for sale at U.S. Disney parks. I made a mental note of the items that I planned to purchase at the end of the day and then continued toward the Tokyo Disneyland Hotel. The Tokyo Disneyland Hotel was just outside the entrance to Tokyo Disneyland. Steps away from the hotel, the Tokyo Disneyland Station offered easy access, via monorail, to Tokyo DisneySea. The approach to the hotel from the monorail station was breathtaking. The towering, Victorian-style building flanked a courtyard with Disney-character topiaries. There was a Bibbidi Bobbidi Boutique and shopping and dining venues along the lower level of the hotel. I am, unfortunately, too old for a princess makeover at the Bibbidi Bobbidi Boutique. I browsed in a nearby shop and then made my way to the hotel lobby. The hotel lobby was grand, with high ceilings, accented by chandeliers and skylights with stained-glass touches. Bronze Mickey and Minnie statues greeted guests as they walked through the main entrance. Opposite the entrance were tall windows that looked out at Tokyo Disneyland Station and offered a peek at Cinderella Castle. There was a café and bar where diners could enjoy this view along with meals, drinks, and desserts. 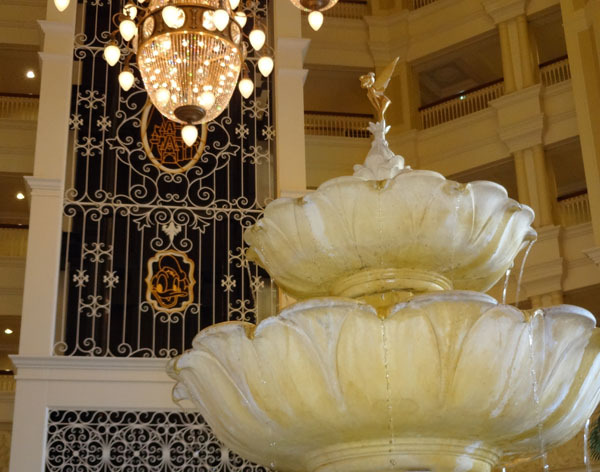 In the center of the lobby, Tinkerbell topped a soothing, multi-level fountain. A windowed elevator, that offered guests a view of the lobby as they traveled, was laced with ironwork that featured iconic Disney images. 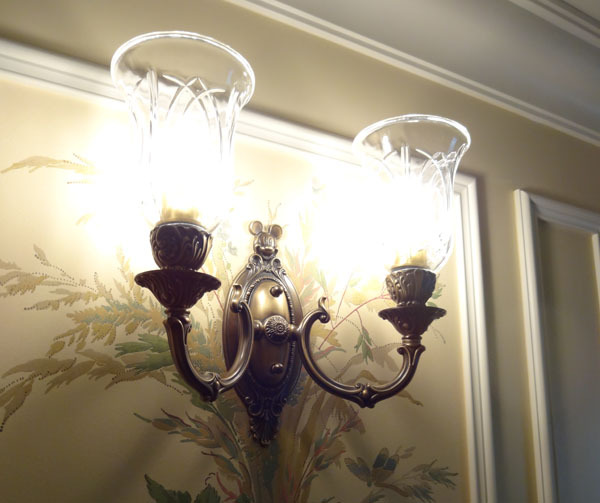 I took a walk down a guest room hallway where housekeepers greeted me with a bow and a “Konnichiwa.” In the hallways, I spotted Mickey, incorporated into the wall sconces. Outside the front entrance of the Tokyo Disneyland Hotel, sculptures brought to life the famous sorcerer’s apprentice story from Disney’s Fantasia. Brooms, holding buckets that spouted water, filled the overflowing inner fountain. Sorcerer Mickey stood at the center. 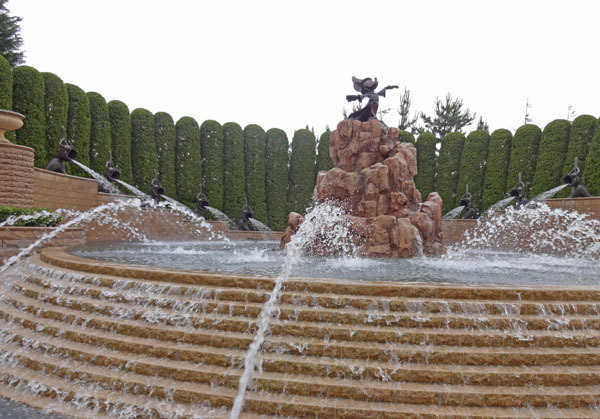 Seeing the story that had captured my imagination as a child in the form of a fountain was enchanting. This just might be my favorite fountain in the world. 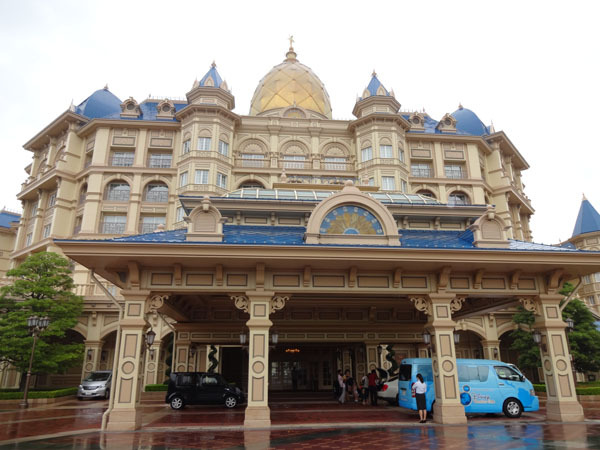 Disney Ambassador Hotel was located between Tokyo Disneyland and Tokyo DisneySea. It was a short walk away from a quick monorail ride to the theme parks. 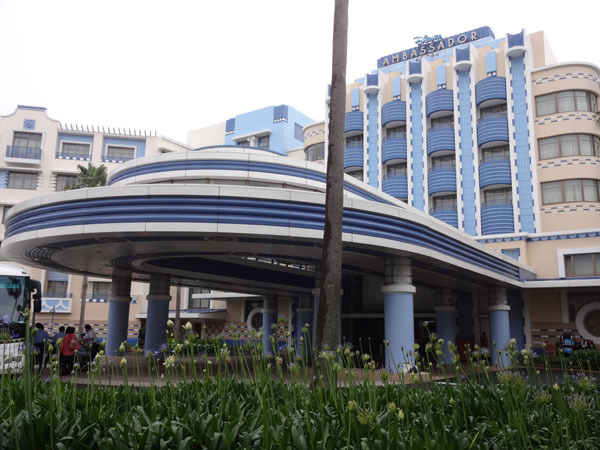 The Disney Ambassador Hotel had an Art Deco style cruise ship vibe. 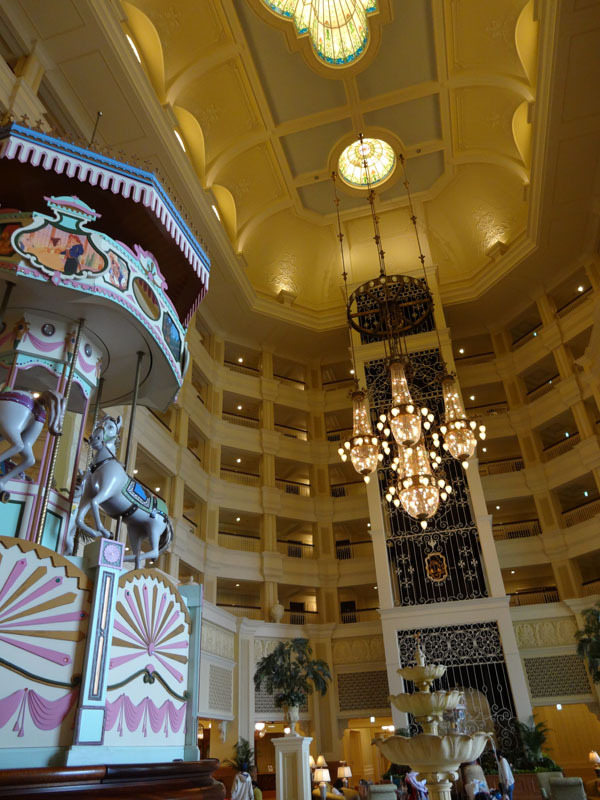 The lobby felt more intimate than the Tokyo Disneyland Hotel, and a bit more geared toward children. The ceiling featured a mural of Mickey’s friends on an airplane adventure. Toward the center of the lobby, there was a sculpture of Mickey working as a movie director. It was so shiny that it was difficult to fully appreciate or photograph. My favorite feature of the lobby was the piano music that seemed to be coming from the unattended piano. I just had to sit for a few minutes and enjoy it. 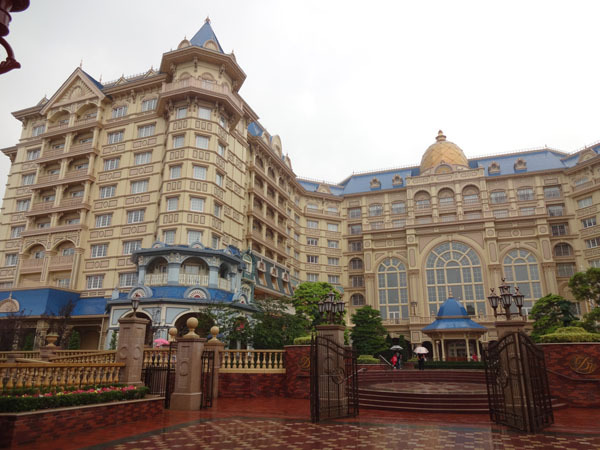 The final Tokyo Disney Resort hotel that I visited was Tokyo DisneySea Hotel MiraCosta. 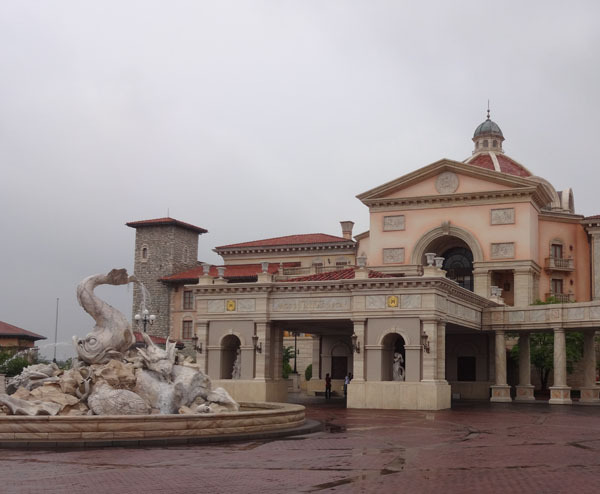 The hotel was not just near Tokyo DisneySea, the MiraCosta was actually part of the theme park! Hotel guests had their own “secret” entrance to DisneySea. 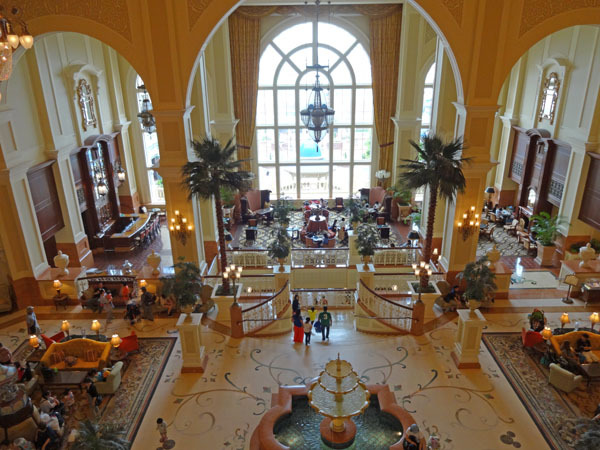 The hotel’s theme matched Mediterranean Harbor, the DisneySea “port-of-call” of which it was a part. At the front entrance of the MiraCosta was an ancient-looking fountain featuring slightly-scary stone creatures spouting water from and around their bodies. 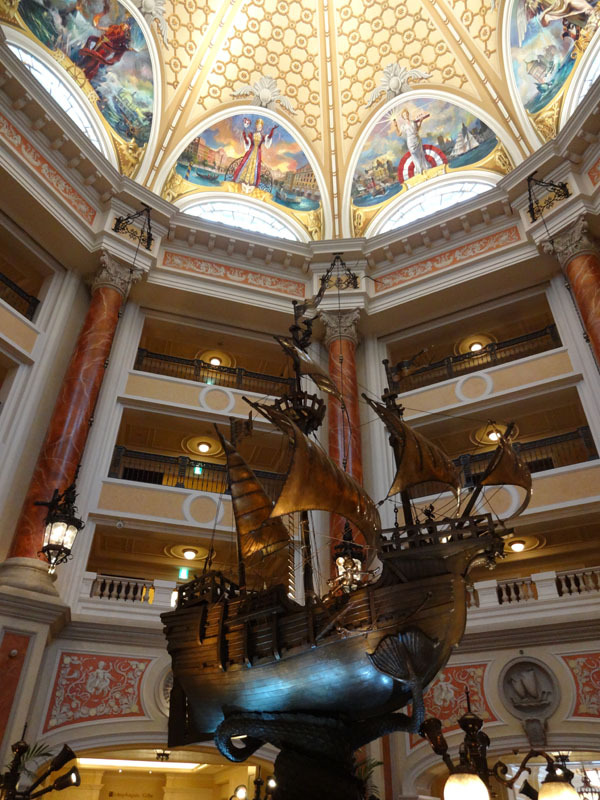 In the main lobby was an impressive brass ship which sported Disney touches on close inspection. 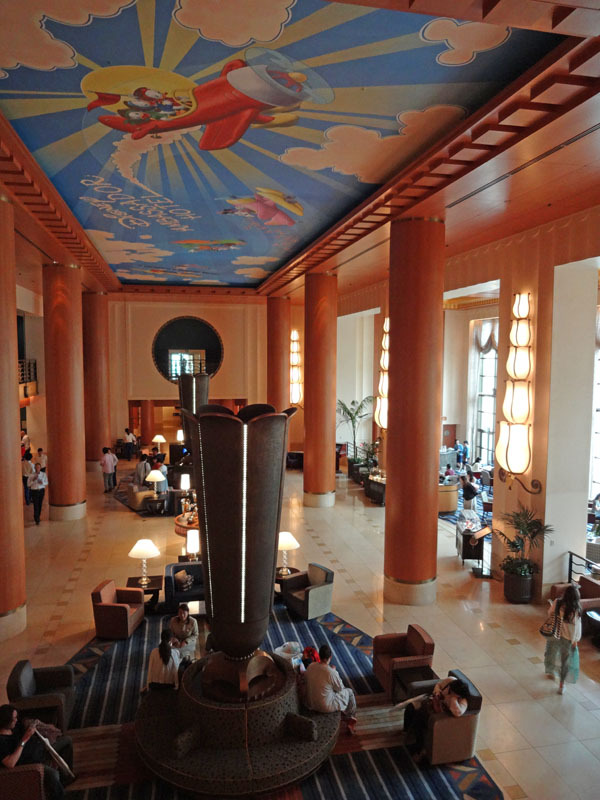 The MiraCosta lobby had a more adult feel to it than the other hotels, and, like the Disney Ambassador Hotel, it felt intimate. 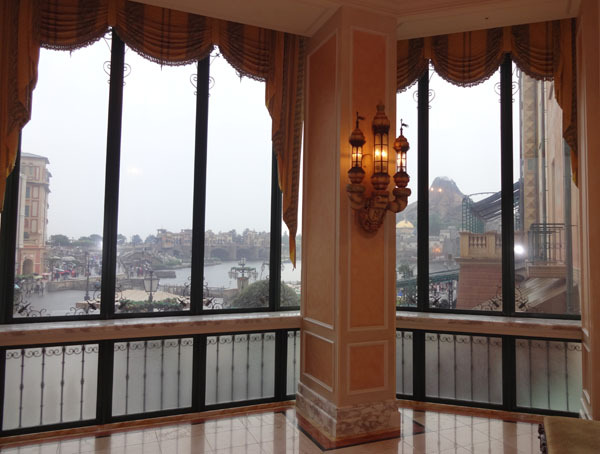 Just off the lobby, large windows revealed that the hotel really was part of Tokyo DisneySea. The windows looked out directly into Mediterranean Harbor with Mount Prometheus, the volcano, as an ominous backdrop. 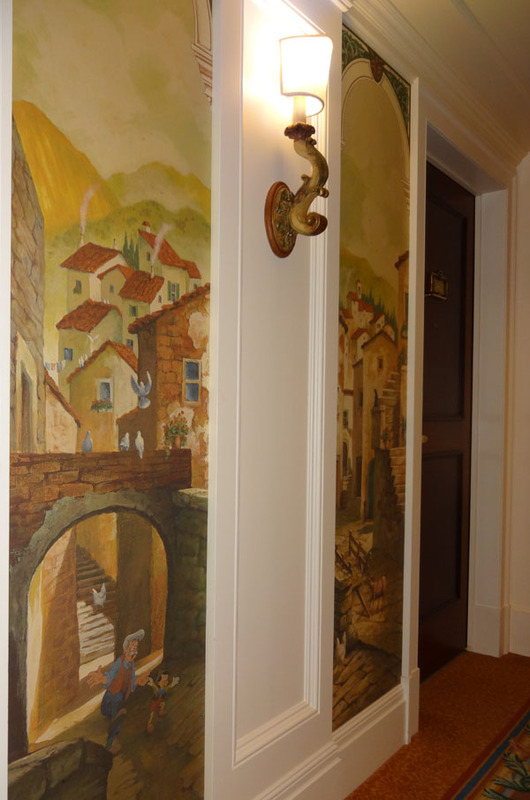 After staring longingly into the park, flooded with happy memories, I took a jaunt down a guest room hallway, where I found the story of Pinocchio somewhat subtly incorporated into the murals. The outdoor pools at the three Disney hotels at Tokyo Disney Resort only open in the summer, and were not yet open when I visited in June. I did take a look at Hotel MiraCosta’s small, but bright and lovely, heated indoor pool. Like most upscale hotels in the Tokyo area, there was a steep fee for hotel guests wishing to use the indoor pool during their stay. 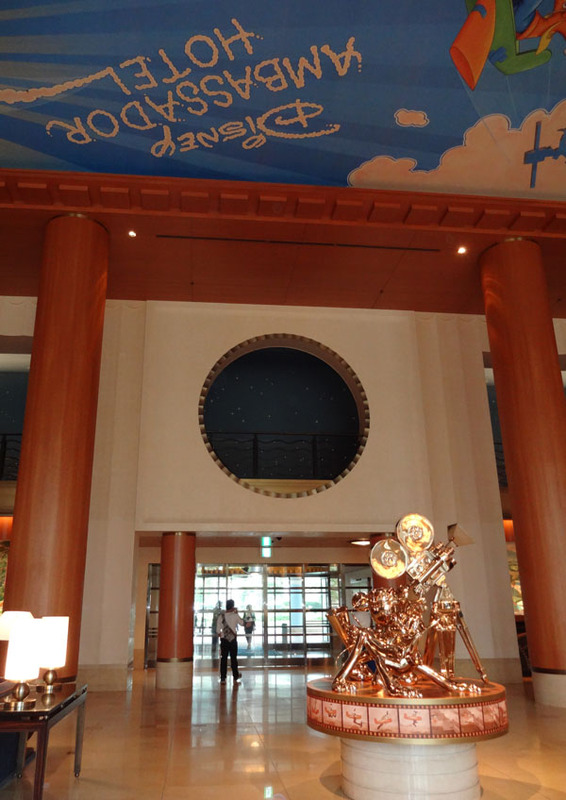 Ikspiari is Tokyo Disney Resort’s answer to Downtown Disney. There were stores that one might find at a typical shopping mall, selling mostly clothes and shoes at typical mall prices. There was also a movie theater, a food court, and a large Disney Store. 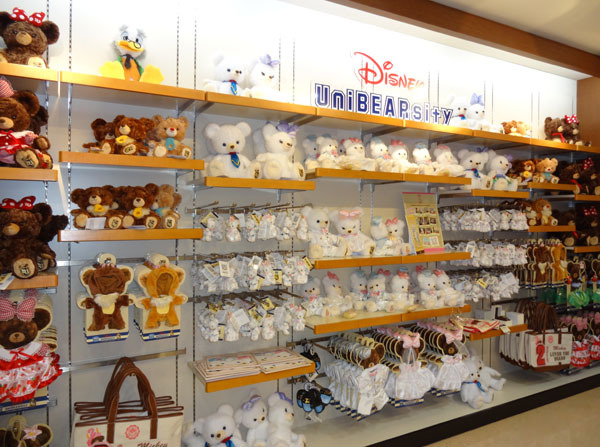 Among the extensive selection of Disney items, from Disney character backpacks to Disney UniBEARsity plush toys, the Disney Store featured bargain clearance merchandise which was eagerly snapped up by shoppers. The sun was starting to set when I made my way back to Bon Voyage to make my final purchases. It was hard to believe that I’d spent an entire fun-filled day at the Tokyo Disney Resort without entering either of the two theme parks. 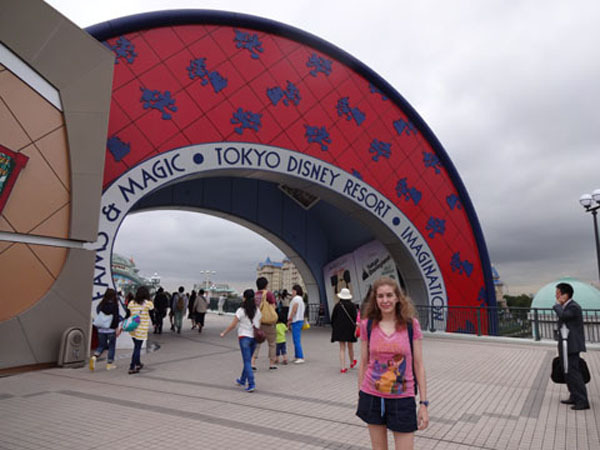 It was something I hadn’t planned when creating my Japan itinerary, but something I’d recommend to any Disney fan who travels to Tokyo to see Tokyo Disney Resort. I did this in 2013 near Tokyo, Japan. P.S. Inspired by my trip to Japan, I wrote a novel called Lost in Tokyo, about a girl finding herself and falling in love. Lost in Tokyo is available at Amazon.com and is FREE with Kindle Unlimited! Don't miss this powerful, romantic story with shocking surprises that you'll never see coming! Nineteen-year-old Erin is hoping that her visit to Japan with her best friend, Adam, will be life-changing. When Erin was just four years old, her mother mysteriously vanished. Erin's only clue to her mother's possible whereabouts is a hand-written itinerary for a dream trip to Japan, a trip that Erin doesn't know if her mother ever had the chance to take. Erin has decided to carry out this itinerary, believing that it might help her find her mother. But Erin's trip won't be going according to plan. Hours after they arrive in Tokyo, in a jet-lagged fog, Erin and Adam end up in bed together. While struggling with the tension that now dominates their once innocent friendship and the trauma stirred up from Erin's painful past, Erin and Adam visit the places on her mother's list. As they explore the wonders of Japan, Erin finds herself haunted by strange "memories" that seem to belong to her mother. Could these memories be real? If so, perhaps her mother can be found. If you love inspiring young adult or new adult romantic contemporary novels, don't miss this powerful read! LOST IN TOKYO provides a travel guide of wonderful things to see and do while on vacation in Japan (featuring attractions in Tokyo, Kyoto, Nara, Nikko, and Kamakura) wrapped in a coming-of-age story of healing and hope, with an unexpected ending that you'll never see coming. LOST IN TOKYO is available as a Kindle ebook and in paperback. Read the Kindle ebook for FREE with Kindle Unlimited. If you're an Amazon Prime member and you own a Kindle e-reader, Fire tablet, or Fire phone, you can borrow the LOST IN TOKYO ebook for FREE from the Kindle Owners' Lending Library.